April 22 is National Jelly Bean Day. Although these candies are mostly associated with Easter, they are popular all year long. 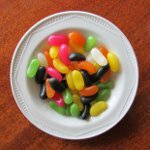 Jelly beans are likely to have appeared during the time of American Civil War. William Schraff, a Boston confectioner, urged his customers to send jelly beans to the soldiers. Today food historians believe, that first jelly beans appeared around that time. The very first advertisement of jelly beans appeared on July 5, 1905, in the Chicago Daily News. They were sold for 9 cents per pound. Earlier jelly beans were associated with Easter because of their egg-like shape. However this changed, that is why we can enjoy these candies anytime. And did you know, that jelly beans were President Reagan's favorite candies and he used them to quit smoking, when he was the governor of California? Each year about 16 billion jelly beans are manufactured in the U.S. just for Easter. If you line up all jelly beans eaten by folks during Easter holidays, they could circle the Earth for more than 3 times!